Laying hoses over the street is common place for firefighters on duty. To ensure that traffic flows smoothly, hose bridges are used. Unfortunately, guiding traffic over the hose bridges is not always simple. The new modular hose bridge system optimizes their use and secures the operation site. Space-saving, low weight and easy to drive over – these are the advantages of the aluminum hose protection bridge 2B-4M, which is perfectly designed for firefighting operations. The modular construction easily fits in the highly portable 60 x 40 x 18.5 cm transport case. With its minimal size, the hose bridge can be compactly stowed in any emergency vehicle. With only 19.2 kilograms, the 2B-4M is the lightest hose bridge on the market. The very well-conceived system also shows its benefits during assembly of the hose ramps. The transport case for example, is used to find the appropriate distance between the module sections for cars and trucks. With the 2B-4M, the length of transport cases is 2x the length between the hose ramp modules. The transport case however, can do more. It is especially useful for traffic safety. This is because danger and traffic symbols made of reflective foil are placed on the lid of the case, which are highly visible in the night when illuminated by vehicle headlights. When simply placed next to the hose bridge, they warn drivers in time before driving over the hose bridge. If needed, the cases can also be used as drip trays. 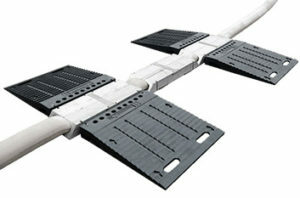 The hose bridge configuration is very simple; the module sections are simply placed next to each other (no need to connect them). The important thing is that the hose is filled with water, so that the modules are weighted down and lay better on the ground. 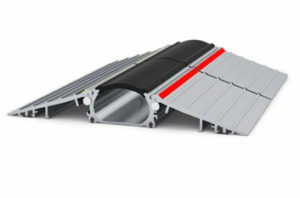 Rubber inserts on the underside of the modules provide a firm hold on slippery ground surfaces. Thanks to the exceptionally low height of only 60 mm, even sports cars that are lower to the ground can drive over the hose bridges with up to 15 km/h. Trucks up to 10 tons. Axle load rolls over the hose bridges with ease. The genius modular construction enables the use of multiple hoses in the standard hose bridges – this is especially useful during large-scale operations using the Z-1T add-on module. Using the aluminum lids, the hose bridges can also be converted into a cable protection bridge with the expansion box Z-1M5T1OD or the accessory Z-1D. With only 19.2 kilograms, the 2B-4M is the lightest hose bridge on the market and is easy to transport in the compact 60 x 40 x 18.5 cm carrier. Additional tunnel modules for further B-hoses can be added in any number. 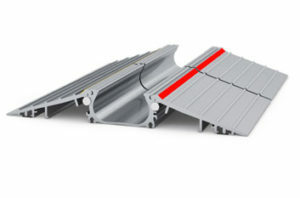 The standard bridges modules serve as on and off ramps. On the lids, the transport cases are equipped warning and traffic symbols made of reflective foil that are highly visible; especially at night. With dimensions of 60 x 40 x 18.5 cm, the space-saving transport case fits easily in vehicles. The case can also be used as a drip tray. The ingenious modular design, the low drive-over height and light weight are the innovations of the patented aluminum hose bridge from SCHILDER Systems GmbH. WOULD YOU LIKE TO LEARN MORE ABOUT THE COMPANY BEHIND SCHLAUCHBRÜCKEN.com? Our modular aluminum hose bridge is a well thought-out system! In this video we demonstrate the simple handling and application of our hose bridge system using a practical example.